Hobart, the capital city of Tasmania, offers visitors a taste of epicurean delights, mountainous views and relic establishments of the convict days. With so much to see and do, you’re bound to be captivated by this charming city. Take your time to wander the popular and lively Salamanca Market, where you can find anything from fashionable clothing and handmade jewelry, to delicate pottery, local artwork, fresh produce and the finest wines. Browse more than 300 stalls showcasing Tasmania’s best products to find the perfect souvenir to take home with you. For a glimpse into Tasmania’s history, visit the well-preserved Port Arthur Historic Site, located on the Tasman Peninsula. The buildings are remnants of the past and give visitors a glimpse into the life and hardships of the convict era. Another must-visit attraction is Mt. Wellington, where there are activities catering to all demographics. Families can enjoy a relaxing picnic or BBQ in the open space, or stroll through the scenic forest paths. Hikers of all levels can choose from the many walking trails winding through the foliage. Don’t miss the chance to head up the pinnacle, where you’ll be amazed at the breathtaking panoramic views of Tasmania’s stunning lands and coastlines. 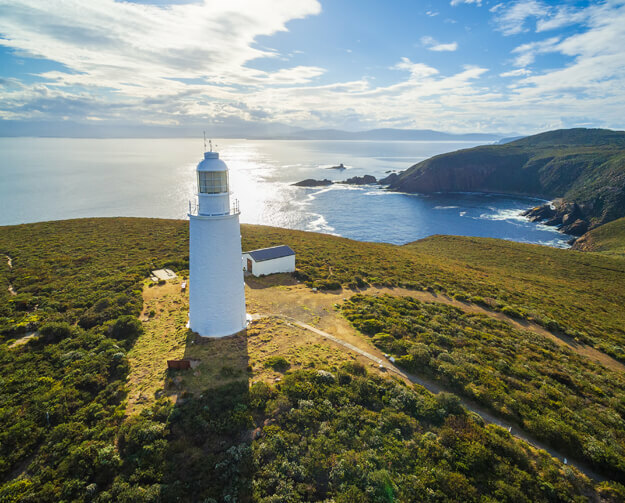 Visit Bruny Island to immerse yourself in the island’s wilderness. Here, you’ll encounter the many species of birds that visit the island and see fur seals, fairy penguins and white wallabies as you explore. After a long day of activities, you’ll no doubt have built up quite an appetite. Take the time to sample the delectable local foods and wines across the many fine cafés and restaurants. If thrills and excitement is what you seek, then Tasmania will readily meet your expectations. You can head down to King River or Derwent River for an exhilarating white water rafting tour among beautiful scenery. For something even more adventurous, try the Franklin River, which will take you between eight to ten days to complete. With class five rapids to navigate through, travelling down the river at high speed will be an experience you’ll never forget. With Azure, you can take a luxury holiday in Tasmania to discover everything that this quaint island has to offer. We pride ourselves on offering top-of-the-range tours and itineraries, so whatever your style and preferences, we can tailor a holiday that will meet and exceed your expectations. With the many luxury hotels in Tasmania we can offer as part of your holiday package, you’ll be treated to the best quality comfort and service during your stay. Contact us to speak to one of our expert consultants, and we’ll help you discover the wonders of Tasmania that await you.